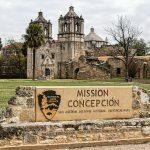 San Antonio touts its annual Fiesta –18-28 April this year — as a “party with a purpose.” It traces its origins to 1890 with the first “Battle of the Flowers” parade, commemorating the Texians victory over Santa Anna at San Jacinto. The participants pelted each other with flowers. That parade — still going strong — eventually grew into a 10-day fiesta featuring more than 100 events, held every year except for 1918 during World War I and 1942 through 1945. Fiesta medals trace their origins to a coin first produced in 1946 by the Texas Cavaliers, a fraternal organization that raises money for charity. Jack Morgan, a reporter for Texas Public radio (and a Volksswalker!) 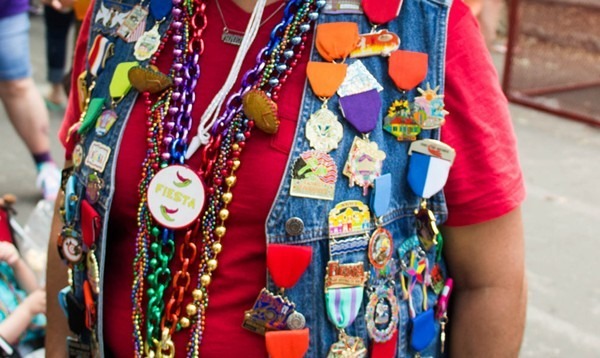 quoted Trinity University cultural anthropologist, Michaela Hayes in a 2015 feature about Fiesta medals: “They had special coins—the king’s coin—and they’re just little half-dollar sized coins. But in 1961 Joske’s department store provided the Cavaliers with a little cardboard piece that had a punch-out in the center where you could insert the coin. And then it apparently had a hole in the top of it where ribbons could be inserted through those. And so you could then hang this around your neck. This is where Volkssporting come in. 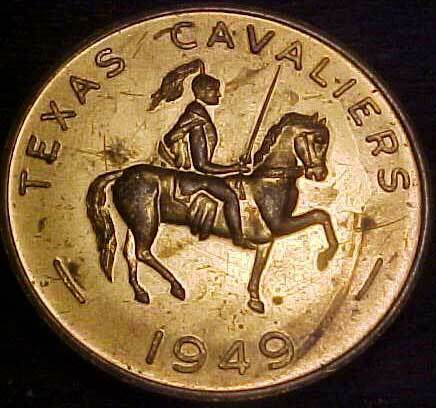 In 1980 then- Lt. Col. Leon Childers, an avid Volkssporter and Volkssport medal collector when he was stationed in Germany, convinced his commanding officer to produce a medal to give TO King Antonio of the Texas Cavaliers when he paid his annual visit to Ft. San Houston. The idea caught on. 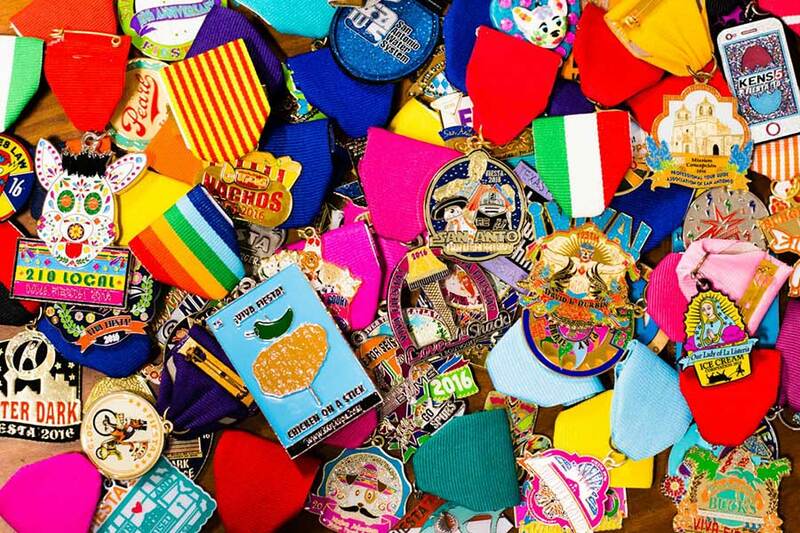 Other people — Fiesta “royalty” — and organizations started producing medals and people started collecting them. By the early part of this century is was definitely a “thing.” Non-profits sell them to raise funds and many, many local businesses use them for advertising. Some of the volkssporting medals, which inspired San Antonio’s Fiesta medals, on display in the newly-refurbished trophy room at AVA HQ. 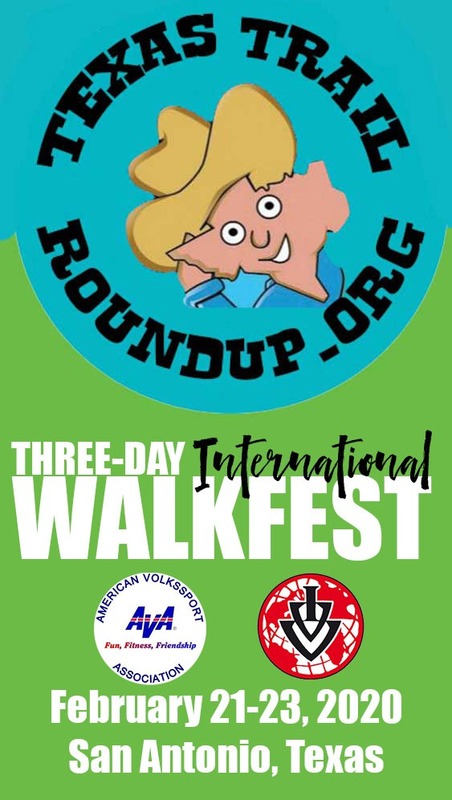 The Texas Wanderers — the AVA club started by Lt. Col. Childers — still hosts an annual Fiesta Volkssmarch — the Caminada del Fiesta, on April 27 — which is one of the 100 official Fiesta events. It will be at the Mitchell Lake Audubon Center again this year as tighter security makes it too hard for civilians to get onto Ft. Sam Houston. UNESCO World Heritage Site: What’s the Big Deal?